I often hear what’s meant to be “helpful advice” usually from well meaning strangers. And while most of the time I can at least appreciate the fact that they’re trying to help; it’s really just getting on my nerves. I’m certainly not against receiving advice, just that when it comes to my autistic child, I really don’t want to hear it. I understand, of course, that on occasion there is good advice. But other times, it’s just not what I want to hear. 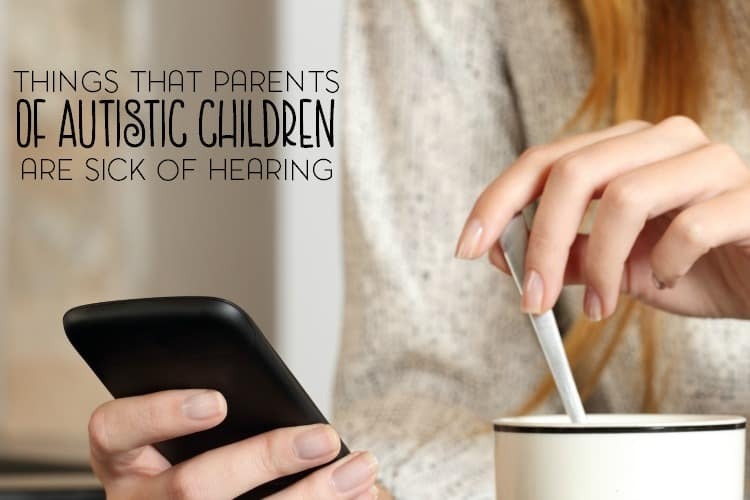 So here are just a few things that this parent of an autistic child is sick of hearing. And if you’re looking for ways to support a family that has a child with autism, please check out my autism resources and inspiration. This list is certainly not comprehensive as there are a few that I probably could have included. Be sure to look out for another version of this list in the near future. “I’m sorry.” Please don’t say this because we aren’t. There’s really nothing to be sorry for. “He/She doesn’t look autistic.” Really? I wasn’t aware that there was a certain way that autism looks. “He/She will grow out of it.” Actually, no. Sometimes, with therapy and maturity, some symptoms of autism might be lessened but in reality; autism is a lifelong disability. “He/She is just being a brat.” Again, no. Individuals with autism are easily overwhelmed and/or over stimulated with social situations, loud noises, bright lights, certain smells, etc. Anything could trigger a meltdown and there really is a difference between a meltdown and a temper tantrum. “Just spank them.” … I don’t know how many times I’ve heard this and been tempted to say back, “I can’t spank the autism out of her anymore than I can slap the stupid out of you.” But usually I just smile or don’t bother to respond. It’s really not worth the time or the stress. This parenting thing is already stressful enough and my patience meter only extends so far during the day. “Well maybe if you did something differently…” Please, go on about how you’re the expert on my child. Don’t assume that the parent hasn’t already tried (insert therapy here) or that, for whatever reasons, they just don’t want to try a certain therapy. It’s a personal choice. “He/She just needs medication.” For personal reasons, I choose not to medicate. I realize that yes, it works for some but I would rather not do it. Again, this is a personal decision. “Well, if you can’t handle him/her, you should just put them in a home.” In that case, are you offering your home? B has her good days, bad days, and she has her good moments and her bad moments. And again, this is a personal choice. What works for some, might not work for others. “Did you vaccinate?” Please, please, please- do not try this with me. I realize that the scientific evidence is changing, but unless you can 100% prove that vaccines are the direct cause in MY child, I don’t want to hear it. “Well, so and so said that her child is cured, maybe you should do what they’re doing.” Hogwash. There is no cure for autism. Yes, you can lessen the symptoms but it does not magically disappear. “I’ll pray for a cure” – I don’t mind the prayers, honestly. And the gesture is certainly appreciated. But, there is no cure. There is no magic potion that will cure my daughter’s autism. A cure implies that autism is a disease- and it’s not. Autism is a disability, a neurological disorder. “My niece/nephew/neighbor’s cousin has autism, so I completely get it” – All due respect- no. Just a thousand times no. “Why would you have more children knowing that you have an autistic child?” Quite frankly, it’s none of your damn business. “Your child isn’t autistic enough” – Thank you, autism expert and genius profound. Please, explain to me the level of autism that you’re experienced with. I don’t really hear this one because my daughter is on the lower end/more severe end of the spectrum. But my good friend and fellow blogger Kaylene over at This Outnumbered Mama hears it all the time. “You shouldn’t say he/she is autistic, you should say individual with autism” – There are many autistic adults, who prefer to use the term “autistic person or autistic individual” because it’s a part of who they are. I go back and forth- sometimes she’s my daughter with autism and sometimes she’s my autistic daughter. “Your life must be so hard, I don’t know how you do it” – Some days, I wonder the same thing! But we get through every day the same way as others do. One hour at a time. I’m well aware, of course, that this does not apply to all parents of autistic children. Just as our children are different, we as parents are different. In no way, shape, or form do I claim to be a universal voice for all parents. I’m just one parent voicing my opinion on what I’m sick of hearing. Are you a parent of an autistic child? What things are you sick of hearing? Let me know in the comments and I will be happy to add your contribution to this list with credit. However, if all you’re going to do is come here and complain and/or insult me? Please know that you will be dealt with accordingly. “I don’t know how you do it. You are so brave/strong etc. I don’t think I could cope”. Makes it sound like we have a choice. I don’t feel very brave or strong. I’m not always coping. I just love my child so I have to do the best I can. Funny, but I don’t mind “I’m sorry”. At least it shows some empathy for what my son and our family are dealing with it. Unlike other parents who don’t say anything and change the subject as soon as autism comes up. Yeah… we don’t really have a choice, do we? Well, maybe we do but that’s not the point. We do this because we have to. And I never thought of it that way. I’ve worked with autistic children before and they have some wonderful qualities. My heart goes out to you as a parent. May your day be blessed. Visiting from Thoughtful Thursday. For me it is the question “what are you doing” like because I am not working and a sahm that I must have a ton of things going on when really I’m just trying to raise a kid with disabilities. It makes me sound like a layabout or a lazy person when I am constantly busy and dealing with my family and my sons issues. This is a great post. I love the insight you’ve given and really honest (and deserved) responses to some very inappropriate comments.